College of Engineering Poonjar admits 3-Year polytechnic diploma holders directly to the 3rd semester B.Tech programmes through the Lateral entry Scheme. Three seats in each branch will be allotted on State Merit(SM) (Fee Rs. 35,000/-) and Three seats will be filled on Management(MG)(Fee Rs. 65,000/-). All seats are filled by Director of Technical education, Govt. of Kerala through the LET examination and online option registration from qualified candidates. All reservation policies are applied as per Govt. rules. 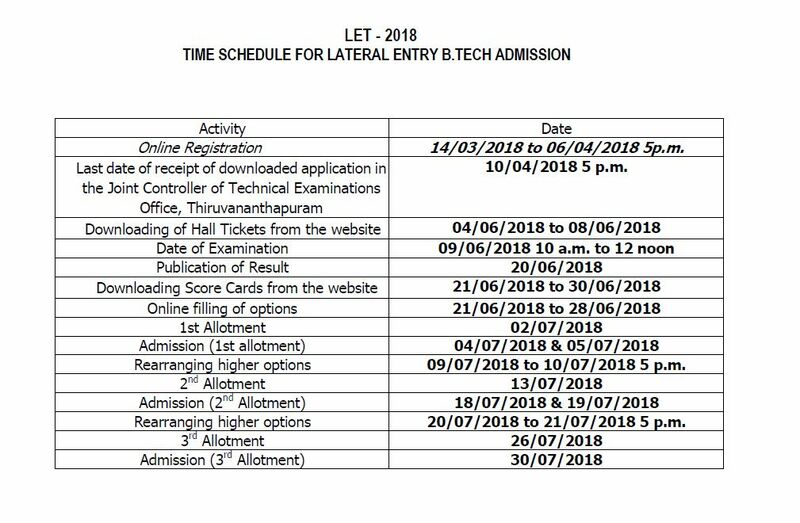 To know more about LET 2018 and allotment procedure, please visit the following links. Admission to lapsed seats will performed at the College through spot admission which will be notified in due time. B.Tech streams available and Fees.